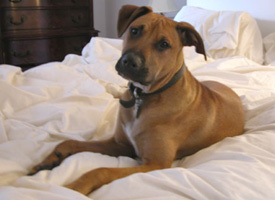 Spike is a Brooklyn Tan Dog, aka Rhodesian Ridgeback with a bit of pit bull. 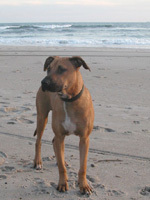 Spike adopted Maggie Estep and her partner John when they were helping walk dogs at B.A.R.C, a shelter in Brooklyn. Spike lives on a diet of raw meat and vegetables and likes to protect his yard from the perils of squirrels, birds, and shrubbery. He also likes to rile up all the dogs at the local dog park by leading the pack in galloping laps for several hours straight.